August 16, 1998 Dorothy West, novelist and short story writer, died. After moving to Harlem, in 1934 West founded and published the Challenge Magazine and its successor New Challenge Magazine which were among the first to publish literature featuring realistic portrayals of African Americans. During the early 1940s, West wrote a number of short stories for the New York Daily News. 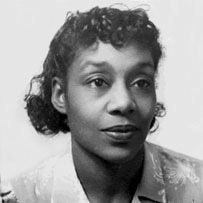 In 1948, West’s first novel, “The Living is Easy,’ was published. For the next 40 years, West worked as a journalist for small newspapers on Martha’s Vineyard. In 1995, her second novel, “The Wedding,” was published and in 1998 Oprah Winfrey turned it into a two-part television mini-series. Also in 1995, a collection of her short stories and reminiscences called “The Richer, The Poorer” was published.